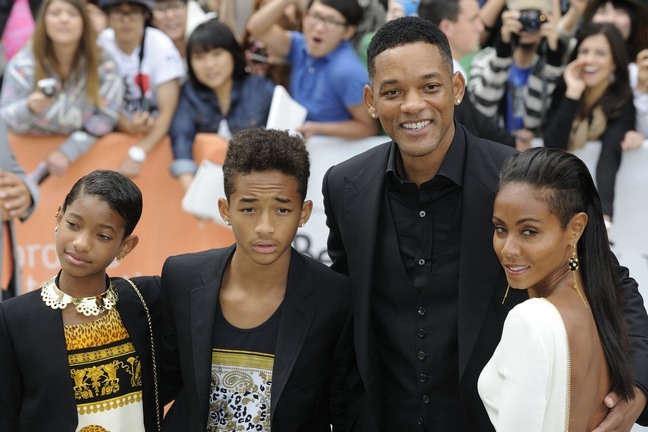 'After Earth' stars Will Smith and Jaden Smith open up about their creative but normal home life, fame, and parenting. Will and Jaden shared with New York Magazine some misconceptions about their family, how they deal with fame and fortune, why daughter and sister Willow decided to step back from the spotlight and more. Who would you say is the biggest star in your family? Jaden: She just knows who she is, so she just is. Will: She has a magic power in the family. She absolutely demands the most attention, and there’s ­something really incendiary about a 12-year-old girl who says and does what she wants. Do you think Jaden could have been a dentist? Will: It may seem like we have pushed our kids into the business, but that is absolutely insane. I would never, ever, push somebody to have their face on a poster that’s going be everywhere in the world. He is making a choice from the informed. It’s less scary to me than if he wanted to be a dentist in that I couldn’t help with what he’d chosen. I have relationships with some of the biggest filmmakers and actors and producers on Earth. So I can be a huge help. Willow chose singing and then un-chose it. She said, “Daddy, I want to go to school with my friends during the week, and I want to hang out with them on the weekends.” At the peak of “Whip My Hair,” she’s like, “Daddy, I’m done.” I was like, “Wow, wow, wow. No, baby, I got Annie [the upcoming movie remake, co-produced by Jay-Z], you know. It’ll be New York, you’ll be with Beyoncé. You can bring your friends.” And she said, “Daddy, I got a better idea. How about I just be 12?” At the end of the day, it has to be their choice. Jada has described the family as transparent. Do you think that’s true? Will: Let me see. Are we transparent? Jaden: You can argue that we’re extremely un-transparent. Everybody knows where we live, but nobody really knows what our house looks like. Jaden: We kind of live in a fortress. Will: I think for the most part we are transparent in the sense that there’s very few big family secrets. I think that if Jaden or Trey [Will’s son from his first marriage] or Willow were to write a book ten years from now, it will be very similar to what people think. And, the things about our family that are mysteries or seem strange, when they’re explained, it’ll be obvious. You know, the forum of media that we’re in can’t really handle the complexity of things that we say all the time. Will: I did an interview where the only quote that everybody ran was “Will Smith doesn’t believe in punishment.” Well, that’s actually ridiculous. That’s not what I said, but the sound bite can’t actually hold the complexity of what I’m trying to say, you know. That there is a destructive aspect to corporal punishment that I don’t agree with. There are concepts and ideas about punishment that I think run counter to healthy growth and psychological stability in this world. But they just take one blurb. Jaden: They’re always gonna do that. Will: Yeah. What’s the blurb gonna be from this one? [Laughs] But for the most part I think we are very transparent, or maybe not transparent, but boring. Will: I think that if you were to come to the house, people would really be ­surprised at how simple and basic it is. Our whole dream for our home was for it to be an artist’s haven. So there are paint supplies; there’s a piano with a microphone and a recorder right there to capture things right in the second. There’s editing equipment. There are cameras. I think the only thing in our house that people would be surprised by is the efficiency. Will: No, just how serious we are about how the microphone at the piano has to be on and the recorder has to be ready to go for when somebody gets an idea. The paint supplies have got to be kept up—you know, you cannot go to paint something and a color’s empty. Is it true that you alphabetized your laser discs? Will: Yeah, I’m very, very serious about systems supporting creative inspiration. Is it hard to educate your kids to be responsible about money when they grew up with wealth? Will: That’s a little new. Jaden: The Cartier is new, but before that it was Louis [Vuitton]. Will: Yes, he has a little bit of a taste. But he connects his responsibility to working and creating to the fun that he enjoys with the finer things. So, Jaden, you like spending the money you earn? Jaden: I have four rings I’m not wearing today. I haven’t bought anything that expensive in a really long time. The only thing I buy is, like, food and skateboards. Will: Once he started approving his own bank statements and credit cards and all, yeah, he changed.